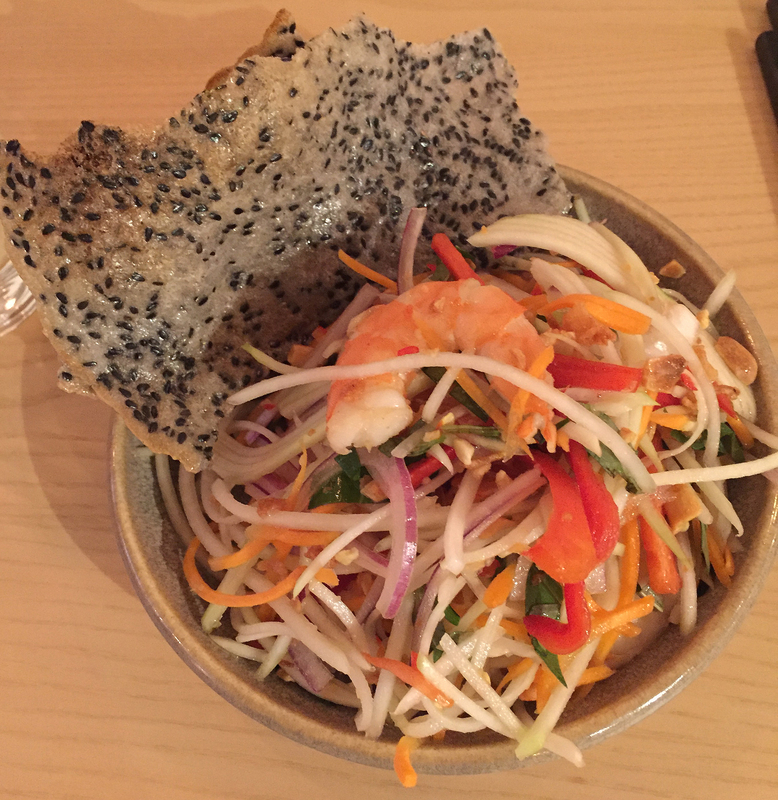 This is a new addition to Brixton – a Vietnamese street food restaurant. We haven’t visited their other branch in Peckham, but this one is bigger and definitely minimalist. Looks like plywood tables and school chairs or benches. Most tables are for two or four and there are two sittings each evening. We went on just their second night, so a few things needed ironing out like whether the lights come on in the toilets (relying on motion sensors that didn’t even respond to a lot of jumping and dancing). The menu is short with dishes described as smallish, biggish, classic and side orders. We ordered from the biggish (Banh Khot pancakes) and the classics (Bun Noodle Salad), with a smallish (green papaya salad) to start. The salad was delightful and not that smallish. It comes with large prawns. We had a good explanation of the ingredients (prawns, carrots, unripe papaya, red pepper, red onion etc., with some fish sauce and chilli). To keep the papaya crisp you have to plunge it into iced water and you can buy them (they are white fleshed) at Chinese and Asian supermarkets. 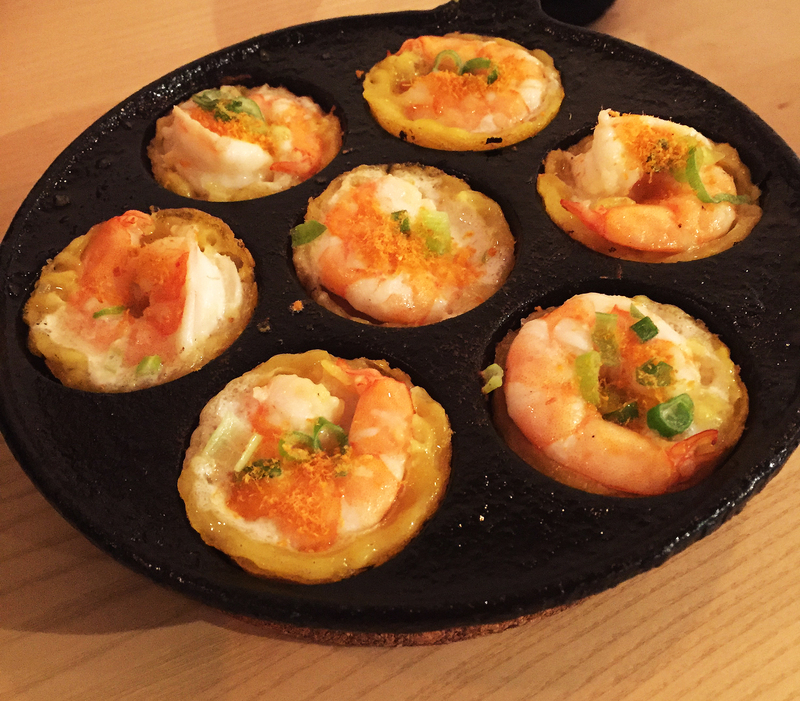 My choice for the next courses was not as good – the prawn pancakes were not what I expected. Although they were presented in an attractive way, they were a bit tough to eat and the pancake part a bit under-cooked. But I did as suggested and wrapped them in a lettuce leaf with some mint and dipped them in the sweet chilli sauce. A bit messy but you do get your greens. The Bun Noodle salad is described as a vermicelli noodle salad with paddy field herbs, noodles, pickles, cucumber, topped with shallots + peanuts. It came with bbq pork patties and a pork and prawn spring roll. This was certainly biggish and also looked really attractive – it was dismantled due to hunger before we remembered to take the photo.It could of had a bit more zing and it’s a shame there were no extra condiments on the tables. 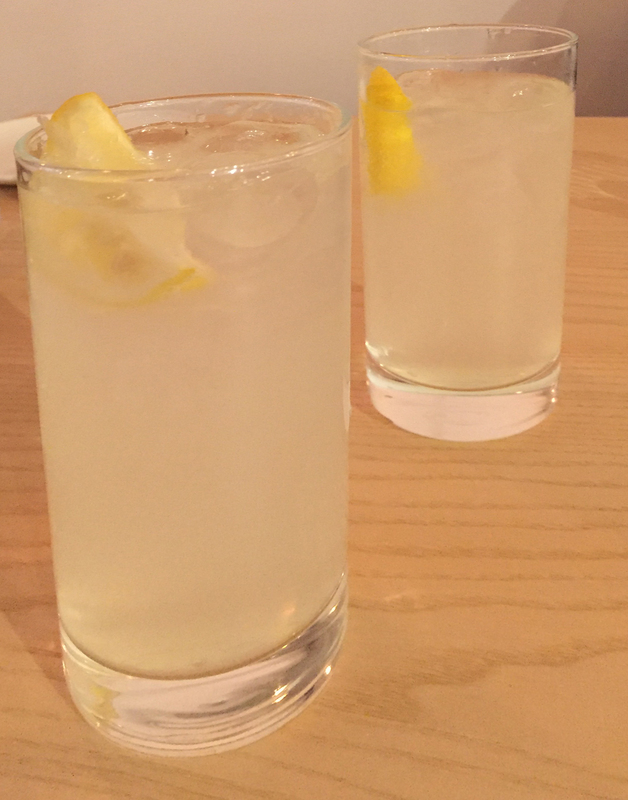 We washed it down with two salty lemonades (there are several homemade drinks to choose from and tap water. There was a whole list of alcoholic drink but this was a school night. The bill including 12.5% extra for “optional service” came to £38.81. We are likely to return but probably not for a few months. Lazy, ignorant and incorrect to tag/categorise a Vietnamese restaurant as ‘Thai’? Presumably you wouldn’t tag an Italian restaurant as French? If you’re going to lump all Asian cuisines together then at least tag it as Asian.